After I returned from Narnia, my mother handed me an old ratty copy of A Wizard of Earthsea, and I explored this fascinating world with Ged. 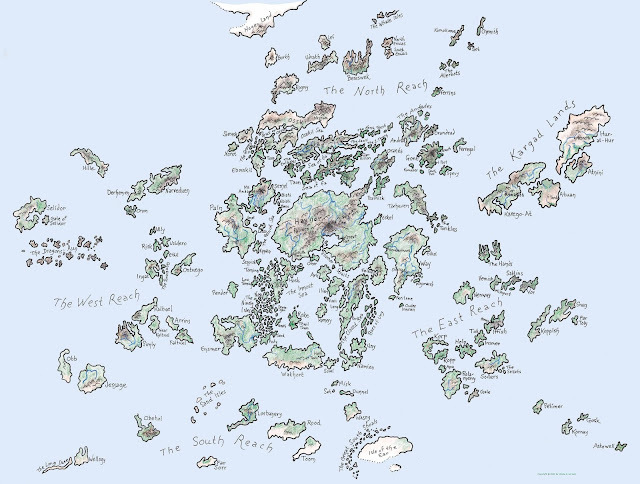 I actually haven't thought about Earthsea for a while, but I was looking at maps online, and I came across this map by accident. It's the map of Earthsea drawn by Ursula K. Le Guin! Now that is a map to base a campaign on! I think it maybe time to go back to Earthsea, especially since I haven't read any of the short stories or the books written after the original trilogy. That is a nice find. A bonus with a novel tied to it (makes for an easier way of getting to know more about the world). 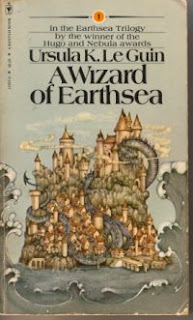 The more I think about it, I am pretty sure that I read "A Wizard of Earthsea" before I read the Lord of the Rings trilogy. I have such vivid images of Ged and his little familiar, the otak if I recall correctly? Actually ran a campaign based on this map back in 1980-1982. Assigned different Islands to different DMs. I had Paln, my wife Kargo-at. Campaign only used the maps, setting was "old school" D&D with very little from the books. I discovered both Tolkien and Le Guin's Tombs of Atuan at the same time and I've been hooked on fantasy ever since. I've only recently got hold of the last of the six Earthsea books and was delighted to read the extra material in the short stories. I've never seriously contemplated running a game set in the world, but who knows, maybe one day.